Size of Male: 55-75 lbs., 25-28 in. Size of Female: 44-65 lbs., 23-26 in. The elegant Pointer dog was bred to be a hard-driving hunting dog. These dogs have been in existence since the 1600s. Powerful and graceful, they make good family companions. Pointers have a good, even temperament, they enjoy being with their family and they like children. They are affectionate, loyal dogs and they are happy to be couch potatoes if you don’t hunt. The Pointer dog breed dates back to the 17th century when they were likely created from the Foxhound, Greyhound, Bloodhound and a “setting spaniel” known at the time. They were originally used to find hares for Greyhounds to course but they were soon adapted as bird dogs when hunting with guns became popular. They have been extremely popular as bird dogs ever since that time. Today, Pointers routinely win many of the most prestigious trials for pointing dogs in the country. 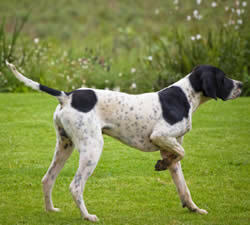 Like many sporting breeds, the Pointer dog is an affectionate and loving dog at home. They are devoted to their family and very good with children. They are intelligent and they can be very intuitive and sensitive. They like to be wherever their people are, in the middle of what’s going on. Although they are active dogs outdoors they like to be indoors and enjoy life at home. They are not at all aggressive and they get along very well with other pets. They can be good watch dogs and give an alert if there is an intruder, but they do not make good guard dogs. Pointers will usually be friendly and welcoming to new people. They do require activities to keep them occupied, especially if they are left alone at home. They also need plenty of exercise. Otherwise they can become destructive when left alone. Living Environment – Pointers prefer to be with their families. They are active dogs outdoors but they prefer to be indoors with their owners. They are happy being couch potatoes. If they get regular exercise they are usually content to nap during the day and relax. They are generally very calm and relaxed dogs. Grooming – Grooming for a Pointer is very simple. They have a short coat that simply needs to be brushed regularly. They are average shedders. You should clean their ears regularly to prevent ear infections. Diet & Exercise – The Pointer dog has ordinary dietary needs. They do require a great deal of exercise. They are a very athletic dog and they love to run. If possible you should try to take dog to a secured area where they can run off leash. However, do not let them run where they could be hit by a car or become lost. Health – The Pointer is a generally healthy breed. However, they can be prone to canine hip dysplasia, cherry eye, epilepsy and dog allergies. If you are interested in this dog breed, you should talk to a breeder about possible dog health problems in these dogs. In the dog training arena, Pointer dogs are very intelligent and quite trainable. However, as sporting dogs they can be somewhat sensitive dogs. They do not respond well to harsh training methods. It’s best to use positive dog training methods (praise, rewards). Your dog will respond much better.